Whole Wheat Gingerbread Cinnamon Rolls make for a cozy Christmas breakfast treat. Molasses and an aromatic spice mix give these sweet rolls their unmistakable gingerbread flavor. This recipe is made with whole wheat flour and no refined sugar. As a food lover and passionate cook, I experience the seasons not only in nature but also in the kitchen. To me the Christmas holidays coincide with lots of baking, cookies and cozy spices. And molasses! It is molasses and an aromatic blend of spices (cinnamon, ginger, allspice, nutmeg, cloves and more) that give these cinnamon rolls their gingerbread flavor… in a TRIPLE dose! Molasses and spices are in the dough and the filling – even the glaze is flavored with a little gingerbread spice mix. I love everything gingerbread flavored this time of year (Gingerbread Oreo Balls, Gingerbread Overnight Oats, Gingerbread Brownies and Pancakes). My kitchen has gone through a few different seasons in the last 5 years and I realized that Baker’s Secret bakeware has always been a part of it. It started when we were newlyweds – our kitchenware consisted of hand me downs and wedding gifts. In fact, we received not one, but two full sets of baking pans. They were all put to good use when – for a while – I went on to be a cake decorator. I still had to invest in more baking pans and decorating tools and Baker’s Secret was always a reliable and economical choice. Now, as a mom and food blogger, I had the opportunity to try Baker’s Secret line of colored baking pans. I baked these Whole Wheat Gingerbread Cinnamon Rolls in the red velvet round pan. Other colour options include pine green, raspberry, pumpkin, and turquoise. So fun! 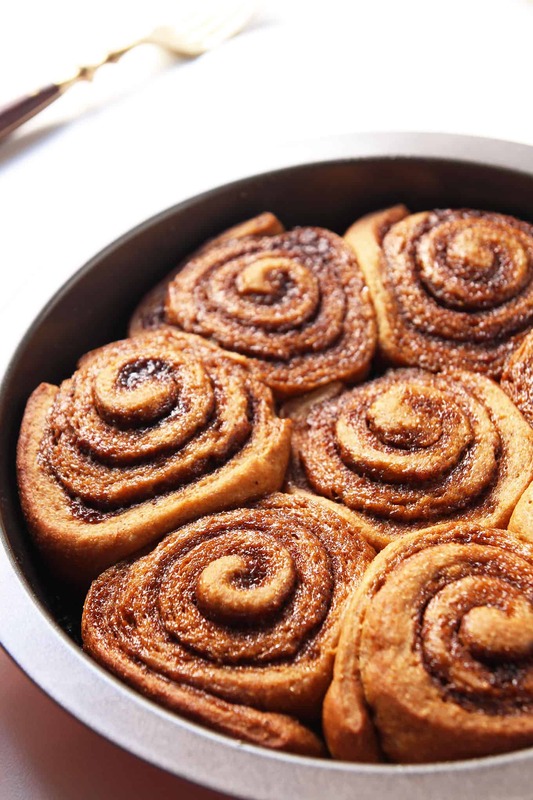 Making cinnamon rolls is a great idea when you have guests staying with you over the holidays. With the overnight option in the recipe, you won’t be working on breakfast first thing in the morning. Prepare the Whole Wheat Gingerbread Cinnamon Rolls the night before, let them rise in the fridge while you sleep and simply bake them up freshly right after getting up. Drizzle some luscious glaze over the buns and you have a impressive holiday breakfast to serve your guests. Add milk, molasses, butter, coconut sugar, egg, yeast and vanilla to a large bowl. Whisk to combine. Add gingerbread spice, salt, whole wheat flour and all purpose flour in 1/2 cup increments. Stir to combine (you can use your stand mixer with dough hook). Add only as much AP flour as needed for the dough to form an elastic ball that doesn't stick to the sides of the bowl. Place the dough ball into a clean bowl, cover with a dry towel and let rise in a warm spot until it doubles in size (1 - 1.5 hours). To make the filling combine melted butter and molasses in a small bowl. Whisk together sugar and gingerbread spice in another small bowl. Set aside. Grease an 8 inch round or square baking pan. Roll the risen dough into a 10x15 inch rectangle. Brush melted butter and molasses mix all over the surface and sprinkle with the sugar mix. Roll the dough up from the short side. Cut the dough log into 8 slices using a serrated knife or unflavored floss for clean cuts, and place in the prepared pan. Let the cinnamon rolls rise again for 30-45 minutes. Alternatively, you can cover the pan and let it rise in the fridge overnight. Bake them fresh in the morning. 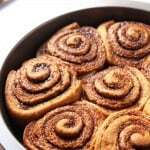 Preheat oven to 350 degrees F and bake cinnamon rolls for 15-20 minutes. Remove from oven and make the glaze. Sift the sugar (unrefined sugar tends to form clumps) and combine with tapioca starch and gingerbread spice. Add enough milk until glaze has desired consistency. 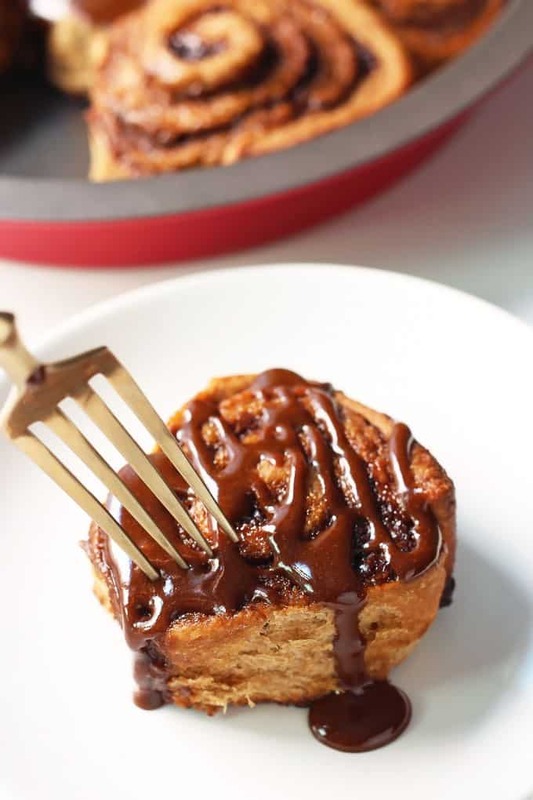 Drizzle over warm gingerbread cinnamon rolls. Store covered at room temperature or in the fridge. * I make my own gingerbread spice mix every holiday season, but a simple mix of ground cinnamon, ginger, nutmeg + cloves will do in a pinch. Disclosure: This post is sponsored by World Kitchen. I have been compensated monetarily and with product. All opinions are my own. Thank you for supporting the brands that make Leelalicious possible. 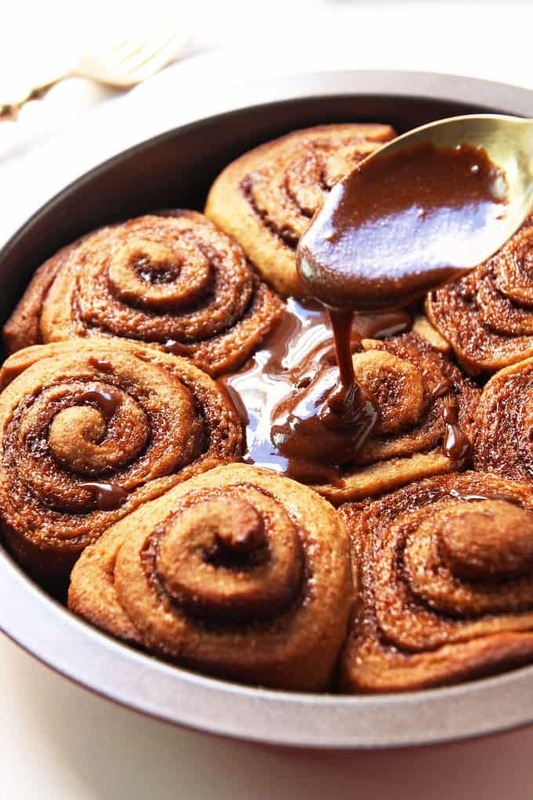 This cinnamon rolls are just out of this world delicious. I never thought whole wheat would make cinnamon rolls look so appetizing. I can’t wait to try them. 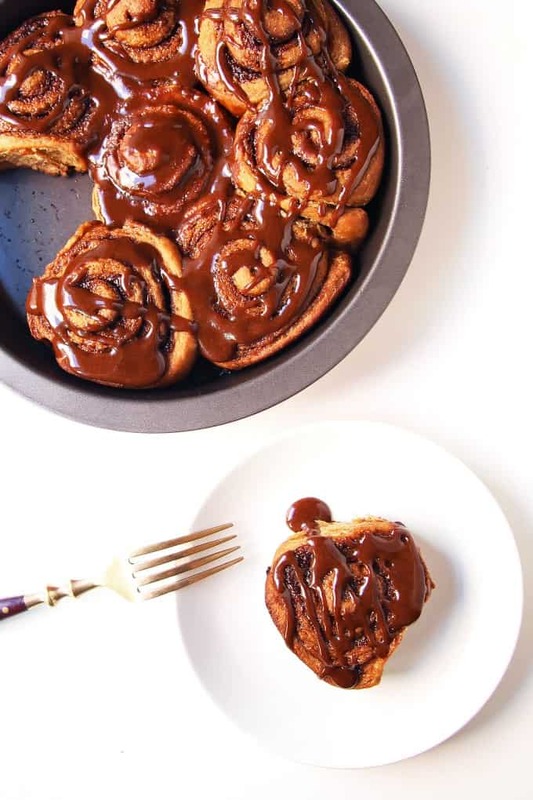 I thought it was nutella or chocolate glaze…these cinnamon buns are perfect for Xmas morning. Wow, you really kicked these up a few notches. Oh man! I wish I would have added this recipe to my buzz feed article on gingerbread breakfast recipes that got featured yesterday! They look sooooooo good!! !